For the most part we love New England weather around here but in the next couple weeks the nights are going to start getting longer and the days are going to get a bit cooler. With that in mind it’s nice to preemptively pick out your fall cookware and refresh or replace it. My favorite fall cookware is my sturdy, giant dutch oven. It does everything I ask of it from roasting a chicken to making a big pot of chili to a bit of boeuf bourguignonne. The dutch oven is the vessel for making cold weather comfort food. I think both of these have their uses and place in the kitchen. As a general rule I usually suggest that people get a 5 1/2 qt oven for two person cooking and a 7(ish) qt oven for up to 6. These are both good standard sized ovens. The most brand recognition among the dutch ovens here is by far Le Creuset. These classic round and oval dutch ovens have been vaunted by culinary luminaries for years. With their iconic colors (the red and orange are flagship colors for a reason) and ombre tone these ovens are certainly tempting. Le Creuset’s ovens are well made enameled cast iron and come in an extremely broad range of sizes and colors. These ovens move great from cooking surface to table as well. Last but not least is the stainless steel option. 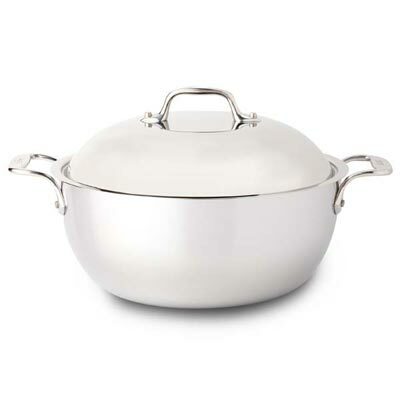 A stainless steel dutch oven can be a great addition to any kitchen – the practical applications of stainless steel are endless and it will work well as a beautiful large sauté just as well as a soup pot or roaster. The one we carry regularly here is made by All-Clad and does a great job of offering fast, even heat and a good shape that is works for all cooking. So what are you waiting for? Grab your dutch oven today and start plotting all of those delicious fall meals that will grace your table ASAP.